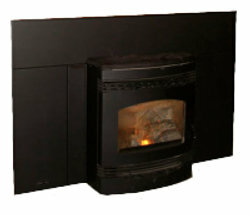 The Quadrafire Santa Fe is constructed of fabricated steel with a cast iron top and optional decorative cast iron pedestal base for the freestanding version. This stove is designed with clean, uncluttered modern styling. 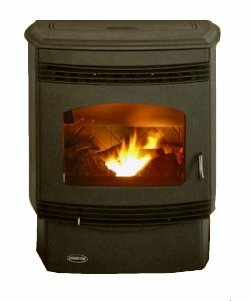 The stove has a large, attractive arched viewing window which shows the herringbone brick effect steel firebox back as well as the fire with its realistic log set. It comes with a thermostat as standard, with the option of corded or cordless remote controls. This stove can burn shelled corn as well as wood pellets. The advised mix is 50:50 but corn can be used by itself. See Comments below. Max. Heat Output 30,000 btu. Hopper Capacity Freestanding 52 lbs. Insert 45 lbs. Burn time Freestanding 34 hrs. Insert 30 hrs. Weight Freestanding 240 lbs. Insert 214 lbs. Window Size 14.5 in. by 9.5 in. Rear Vent Height Freestanding 17.3 in. Three Years: Firepots, Castings & Baffles, Firebox, Heat Exchanger. Decorative cast iron pedestal base, (freestanding). Standard 30 in. by 40 in. Large 33 in. by 50 in. If using corn without pellets as fuel in the Quadrafire Santa Fe, the corn won't automatically reignite unless it has some wood pellets mixed in. This means it's necessary to keep the stove on. To keep the stove running, set the thermostat to maximum. Set the stove itself to low or medium so that the thermostat doesn't get tripped. Clean beneath the heat exchanger, check the door latch and gasket, clean the heat exchanger and drop tube, clean the hopper. Clean the blowers, the exhaust passages and the flue. Clean out the firebox. If you would like to leave a review of the Quadrafire Santa Fe, please use the form on the Contact Page.